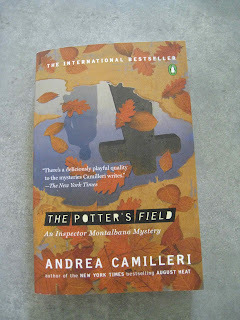 The Little House of Concrete Bookshelves: Andrea Camilleri "The Potter's Field"
The leopard, as I was wont to remark to the late Lester, cannot change his stripes, nor the zebra his spots. Like that mangled quotation, when Mimi Augello strays from the straight and narrow in the thirteenth title in the Montalbano series he doesn't get it quite right. Long term readers will have been aware of the former lothario's conversion to devoted father and would have wondered hoe long the conversion would last. The distraction involved when he does forms one of the strands in the plot line in The Potter's Field, and if he doesn't quite get his choice of nocturnal playmate or his alibi for the presumably unsuspecting Beba quite right, neither do those responsible for the killing that provides the main excuse for another exploration of the interpersonal relationships that revolve around Salvo Montalbano. By this point in the series, of course, there's not going to be much that will be new. There'll be a body, Montalbano will investigate and eventually sort out the puzzle, Mimi Augello will feel undervalued, Fazio will indulge his inclination towards the encyclopaedic when it comes to background research, Catarella will mangle messages, surnames and the language in general, and Livia will engage in trunk line terrorism where Montalbano's peace of mind is concerned. This time around the corpse has been hacked into thirty pieces and concealed in the titular potter's field in what appears to have been a Mafia killing. The thirty pieces, the environment in which they are deposited and the identity of the body, once revealed all seem to point towards Vigata's aging godfather who has a grudging respect for Montalbano and is, we learn towards the end of the story, opposed to the death penalty. Identifying the body, however, is going to be largely a matter of guesswork. It has been concealed for a couple of months, does not seem to match any person reported missing, and the killers seem to have gone to some trouble to ensure that identification is impossible. After a couple of months buried in a garbage bag investigators aren't going to be able to reassemble the pieces to gain an accurate resemblance, are they? There is, however, one minor detail they've managed to overlook. The autopsy reveals a dental bridge in the victim's stomach. and examination of the object reveals a South American origin. Then, conveniently, Dolores Alfano, a stunning Colombian beauty whose skin carries the faint scent of cinnamon, arrived at the police station to report her husband, a sailor with ties to the local godfather, is missing. While his shipboard duties keep him away for months at a time he allegedly makes up for lost time when he manages shore leave, and now, having left a conveniently located love nest to board his ship he appears to have vanished. Once the sample of her husband's DNA has been tested, the body that has been hacked to pieces turns out to be, as one might suspect, Giovanni Alfano and subsequent investigations reveal that Giovanni's father had been executed in Colombia after falling foul of Balduccio Sinagra, though the local Mafia heavy seems to have adopted the son. And, as things turn out, Giovanni's dad was hacked into thirty pieces after his death, reflecting the thirty pieces of silver Judas was paid for betraying Christ. Presumably the son has made a similar mistake since his job would provide opportunities to engage in the trade in contraband cocaine. That's what we're supposed to think, of course, and Montalbano knows the truth lies elsewhere. Discovering the truth, however, is complicated by interactions with those around him. Mimi Augello is in a permanent state of agitation, his wife Beba is concerned and expresses those concerns to Livia who, in turn, gets onto Salvo's case about it. Mimi is, allegedly, involved in numerous overnight stakeouts that Montalbano hasn't actually authorised, but we know what he's really been doing, don't we? The equally predictable question involves the identity of who he's been doing it with (no prizes for guessing here) and the reason why he's insisting the investigation into the murder be handed over to him. 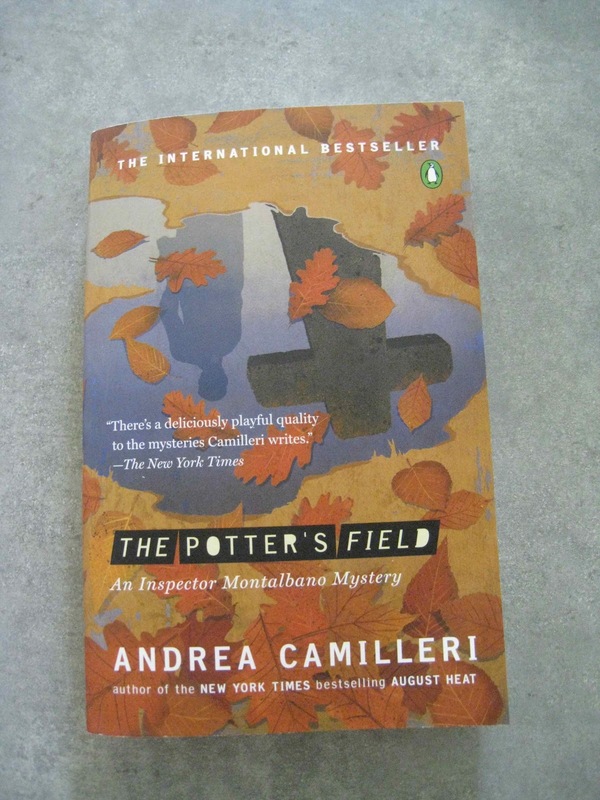 As a result, Montalbano is forced to solve the mystery while apparently off the case himself, save Mimi's marriage and keep Livia from finding out what's been going on. While all that detail could be seen as a spoiler, the actual plot line is, as always, secondary to the personal interactions and pointed political and social commentary. As usual, Montalbano ends up tying the loose ends together rather well in what might just be the best of the series so far. That's promising, since the eighty-six year old Camilleri has another seven titles waiting for translator Stephen Sartarelli's attention. On this latest evidence he's still got it, with plenty more to come. The next title, The Age of Doubt is, by all accounts out in the US next May.